One of my favorite activities (and distractions) is to spend time on the far corners of the internet searching for and reading through recipes. Since college I’ve had a number of food blog favorites that I read on an almost daily basis. My go to list is: How Sweet Eats, Ambitious Kitchen, Edible Perspective, Minimalist Baker, A Cozy Kitchen, & Oh She Glows. There are so many other great bloggers out there in the internet universe and Pinterest, Facebook, & Instagram have made it easier than ever to find amazing recipes, proceed to crave them, and then finally make them. 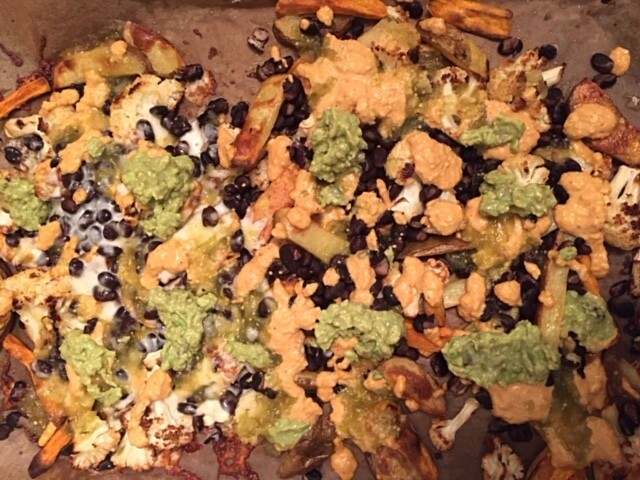 This week I made the Roasted Sweet Potato and Black Bean Nachos w/ Green Chile Salsa from Half Baked Harvest (see link below). This has been on my radar for a few weeks and I was excited to try it! They turned out delicious! This recipe took a bit of patience but overall the recipe was really easy, especially since I didn’t make the salsa and used some jarred tomatillo salsa instead. I subbed a few Dutch Golden potatoes for sweet potatoes because some of my sweet potatoes were bad (see number 3 above!). The combo of white and sweet was nice. As mentioned above, I used jarred Tomatillo salsa (I love Trader Joe’s green hatch chile salsa). We did a little “his & hers” spin with his half of the nachos covered in melty shredded mozzarella, and my half covered with Minimalist Baker’s vegan queso (see link below). The queso was so good he had some on “his” side too. The original recipe suggested a number of extra delicious toppings, we added some quick guacamole and were good to go. Overall, we loved this recipe and will be making it again. Even if you’re not a fan of cauliflower, no worries, cheese/ “cheese” and guac make everything taste good!